Today, the raccoon removal experts at Critter Wranglers will share a few more signs to look out for. 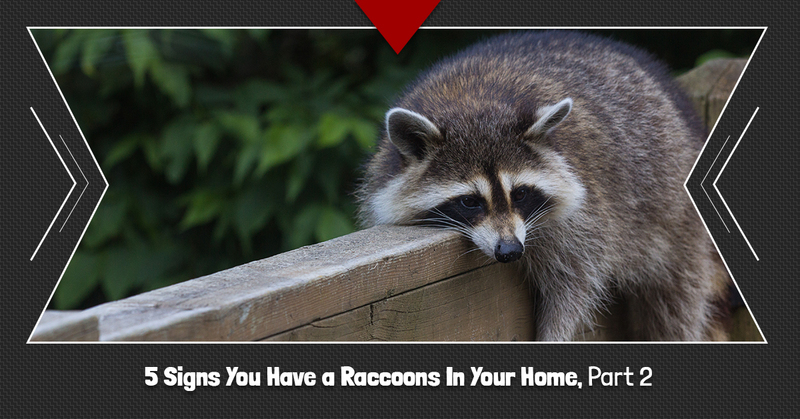 Think you have raccoons in your home? Give Knoxville’s Top Rated Local® wildlife control team a call for a quote and we’ll remove those critters from your home while preventing them from coming back. Have you noticed that your air conditioner or heater aren’t blowing as much air as they should be? This could be a sign that your HVAC ductwork has been damaged by prowling, scratching raccoons. If you find gnaw marks around your electrical systems, or notice chewed up wires, this could be from raccoons. Not only are raccoons curious creatures, but they also love chewing on things to create new materials for their nests, which often leads to damaged electrical wires. Since raccoons love taking over people’s attics, they will tear up the insulation to make scraps for a warm and cozy nest. Insulation is an ideal material for creating nests, so if you notice damage to your insulation, raccoons are likely culprits. Raccoons are both omnivores and scavengers, meaning they will eat whatever they can to fill their bellies and get the nourishment they need to survive. Therefore, your trash cans are essentially a 24-hour buffet for raccoons, so if you notice frequently overturned trash cans, rummaged-through trash, or trash completely strewn about outside the can, this is a sure sign of a raccoon feast. Raccoons often leave tracks behind. If you notice raccoon tracks near trash cans, garages, gardens, other areas around the home, you most likely have a raccoon problem. If you notice any of the signs we’ve gone over in our blog series, raccoons have probably taken up residence in your Knoxville home or business. But there’s no need to fear when you have the wildlife control experts at Critter Wranglers on your side. Call us today to schedule a raccoon removal and we’ll handle the problem in the most efficient, humane way possible.